eToro has solidified itself as the world’s leading social trading platform. eToro offers both short-term options for day traders and long-term options for investors.Easy to use, and all of the information on the platform accessible on both web interface and in mobile app.More than 6 million people worldwide choose eToro as their preferred trading platform. 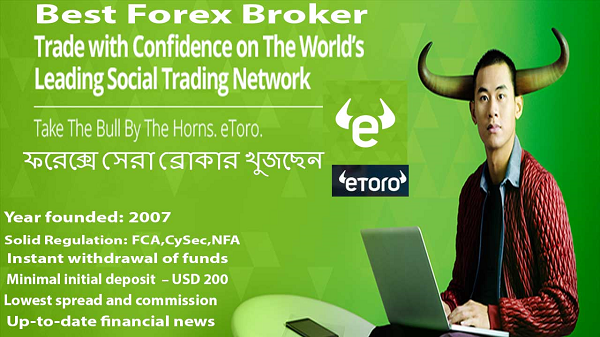 eToro, like all other brokers, cannot offer any Bonus or Offer for the first deposit. As regards withdrawals, the minimum amount if of 50$, and there is a 25$ commission fee. eToro applies Spread and Overnight (roll-over) commission fees. Moreover, since eToro is an STP broker, spreads are not fixed, they depend on different market factors in every single moment. It should be pointed out that the minimum spreads eToro applies are slightly higher than the average.